Artificial light emitted from cities at night is known to spread over considerable distances and result in over illumination of nocturnal environments. 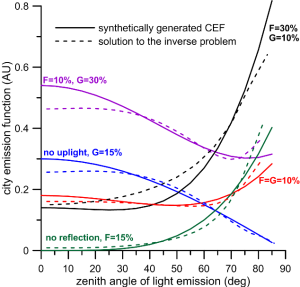 Predicting the collective optical effects that all city lights can have on the diffuse light of a night sky is generally impossible without information on the city emission function (CEF). However, the CEF is difficult to determine due to a diverse and generally unavailable inventory of light sources and, because of manifold light interactions with light-emitting or blocking constructs. The research performed by our team promises great progress in light-pollution modeling as this is the first time the indirect remote-sensing method, to retrieve the CEF from sky-brightness measurements, has been developed and successfully applied to experimental data. 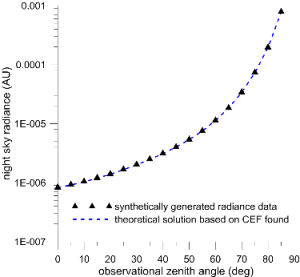 Angular emission function of the CEF is determined by applying an inverse operator on the first-mode radiance data. This is an entirely new technique in the field of light pollution and we believe it can revolutionize acquisition of CEFs worldwide because no aerial survey is necessary, such as that made in Berlin, Germany (Remote Sens. Environ. 126, 39-50, 2012). Aerial survey is however expensive when carried out routinely and is designed for spatial analysis of sources of light pollution, rather than for obtaining the cumulative CEF. In contrast, the technique we have developed is numerically fast, experimentally simple and cost efficient, thus having great potential for use as a CEF solver to which no competitive alternatives yet exist. Left plot is to prove that all CEFs were reproduced successfully with an overall discrepancy being smaller than 3%. Right plot is to demonstrate that a regularized solution matches the synthetic CEF very well. KOCIFAJ, Miroslav. Retrieval of angular emission function from whole-city light sources using night-sky brightness measurements. In Optica, 2017, vol. 4, no. 2, p. 255-262. (7.727 – IF2016). (2017 – Current Contents). ISSN 2334-2536. SÁNCHEZ DE MIGUEL, A. – AUBÉ, Martin – ZAMORANO, J. – KOCIFAJ, Miroslav – ROBY, Johanne – TAPIA, C. Sky Quality Meter measurements in a colour-changing world. In Monthly Notices of the Royal Astronomical Society, 2017, vol. 476, p. 2966-2979. (4.961 – IF2016). (2017 – Current Contents, WOS, SCOPUS, NASA ADS). ISSN 0035-8711.